This blog post is long overdue, about 6 months, but there are good reasons for it. 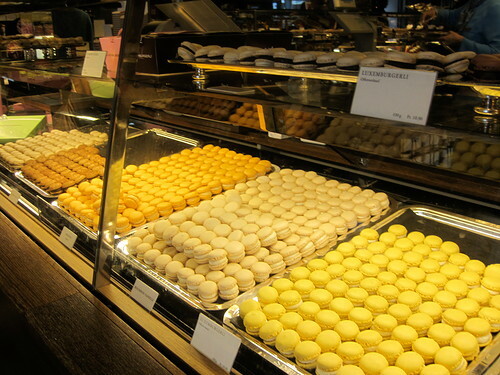 One, I just got lazy since I had been blogging so much about our travels. Second, I was putting together preparations for our move across the pond. For those that don’t know, we relocated to Amsterdam back in October, and love it. We intend on using this new location to the fullest, and travel as much as we can since many new places are a lot closer. Weekend trips to new places is something that really intrigues us. Anyway, onto the last new country we visited, Liechtenstein! 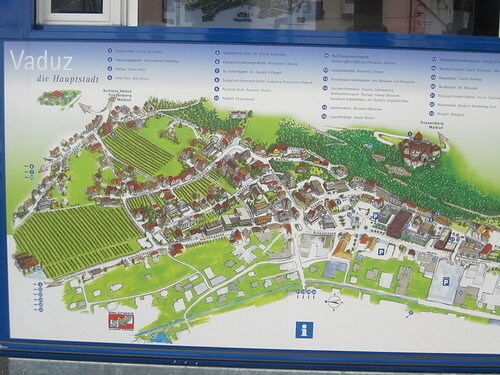 This map shows you how large Vaduz is...or how small really! Now, I’ll first say that about 90% of my friends had never even heard of this country, let alone be able to point out on a map where the hell it’s located! Being a geography freak myself, I always wanted to visit all the tiniest countries in the world. Europe has a handful, and we’ve seen a few: Vatican City and Luxembourg. We plan in 2011 to see Andorra, Monaco and San Marino….and maybe Malta….and Cyprus. Who knows, I’m known from time to time just to go somewhere because I’m bored. 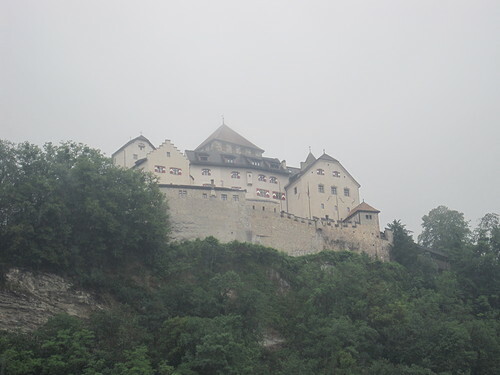 This visit was easy, as we were staying in Zürich, and it’s only about a 1.5 hour trek over to Vaduz by train and bus. The train ride scenery was spectacular, as it glides through Eastern Switzerland which is full of mountains, waterfalls and the clearest lakes you’ll ever see. 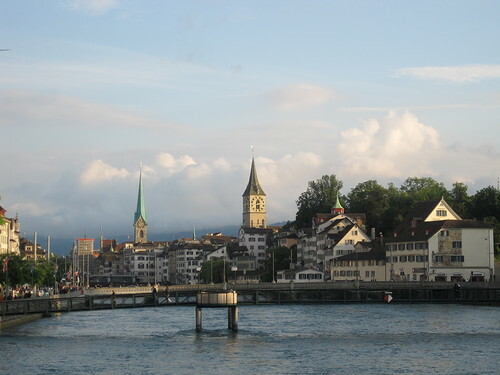 Switzerland passed an ordinance way back that allows no sewage dumping in any lake. Some of the locals say the lake water is cleaner than the tap water. Not sure if that’s true, but it sure looked like it was. 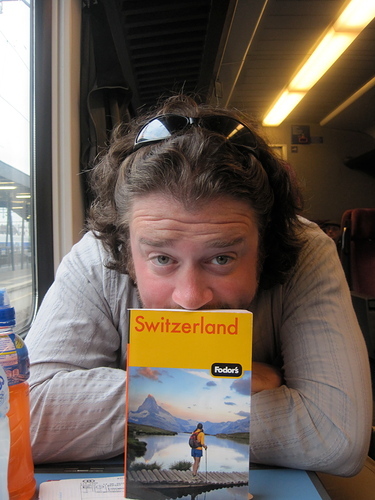 We took the train for about an hour until we got to Sargans. 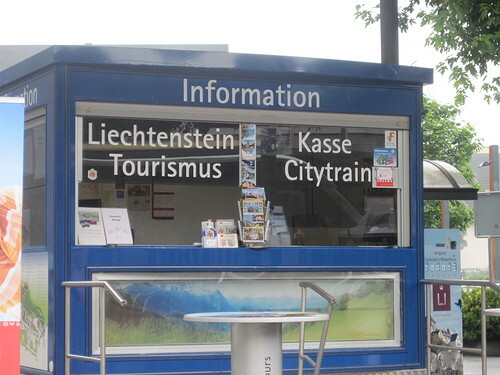 From there, you had to catch the “Liechtenstein Bus” that would take you into Vaduz. Now many people thought we were crazy for traveling over to Vaduz for what was about 3 hours, but I can tell you now after doing it, that’s what most people do. There isn’t a whole lot to see there, but it’s worth the day trip for sure. 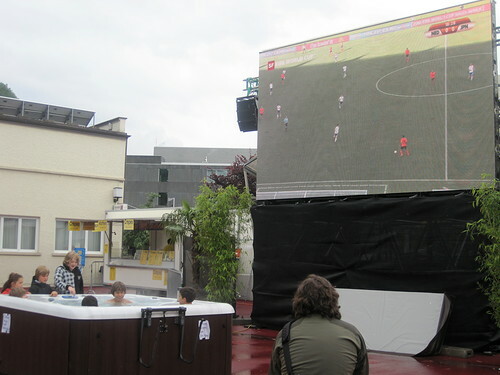 Watching the match in town square...hot tub for kids?? The weather was pretty dismal that day, but that never stopped us before. Vaduz is quite small, with a nice town square, some restaurants, museums, etc. The royal castle is also in town, and sits overhead the town. It was pretty cloudy that day, so we didn’t get a great view of it, but I was told we didn’t miss much as tourists are not allowed inside, as they royals still use it as their personal residence. We realized there wasn’t much to do, so we grabbed a bite to eat in town, headed over to the store to get our country magnet, and then sat in the square as many were watching a world cup match on a big screen. I assumed if the weather was better the square would’ve been packed, but oh well. One other thing we did which is customary for tourists in Vaduz is to get your passport stamped with a “tourist” stamp. Liechtenstein is part of the Schengen Zone, and doesn’t have an airport, so officially you don’t need to be stamped when you visit. The country has taken advantage of this “tourist” stamp that they give people, just to show proof that you visited the country. Well, we had to get one, and 3 euro’s later, we both had one in our passports. I’ve already been asked where I got that and “where is that place” many times, so I guess it’s a conversation starter. 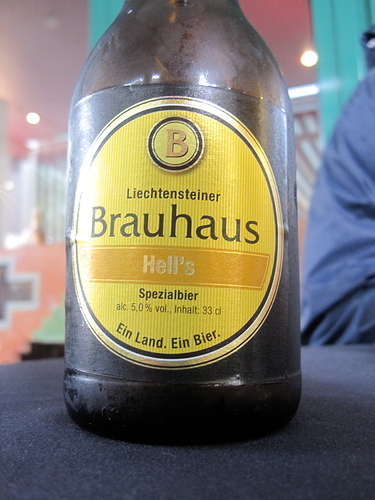 Always try out the local beer....this was good...and from Hell!! All in all it was a quick trip to Vaduz, and I’m glad we went. It really is a nice little town, but unless you’ve got extreme wealth and are trying to escape taxes, or are naturally a resident of this tiny country, there aren’t too many reasons to visit….of course unless you want that illustrious stamp! The tourist booth....really just the place to get your famous stamp! The 2011 travel schedule is starting to take shape, with our travels kicking off in January with a trip to Istanbul, Turkey! I plan on getting us to more countries this year than ever before, with the goal being around 18 or so, with a trip to continent #5 in the works. My old goal of reaching 50 countries before we settled down I think is a goal of the past now, and now I want to hit 75! I think we can do it, just have to work a ton before we can do so. Cheers!